Today my friends, please allow me to reflect a little about motherhood, my motherhood. Motherhood for me is such a great blessing. I bet for my mommy readers too. 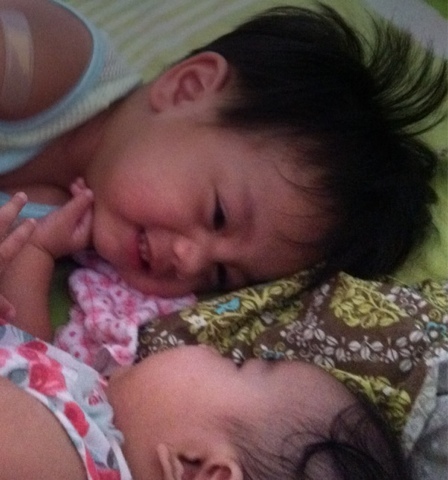 Having two adorable kids to hug, cuddle, kiss and love is the most precious gift God has given me, or us. It’s hard to rationalize a mother’s love. How could you possibly love with all your heart, mind and soul the very reasons why you have sleepless nights, depleted savings, no social life and severe lack of intimacy? How could you say you love someone you shout at, gape at and resist from in order to serve discipline? Oh, the wonder of motherhood! You see, what I’m trying to arrive at is this, motherhood is the best thing that ever happened to me but that does not mean I do not struggle when it comes to raising my kids. I meet mommy challenges every day. I experience heart aches, fatigue, burn-outs and temporary insanity. I get my own share of bad days, then worse days. I feel guilt. I worry, a lot. I question myself as a mom a hundred of times over. I have insecurities. I feel like I’m not giving them what they deserve. I envy others. I sometimes feel like a failure in this motherhood job. I pray. I take a deep breath. I relax my muscles. I seek for clarity of mind and heart. I focus on my blessings. Only then, I credit myself a little for being a mom of my children. I know I love them. I really do. But oftentimes and perhaps shaped by the world, I look for a measurement in which I could gauge myself with as a mother. Yeah, I know, that’s being hard and unreasonable on myself. But, I find answers in my kids. Despite their terrible and irritating ways, I still find them lovable and priceless. They are not perfect as children as well but I love them just the same. Maybe that’s the way I am for them too. Despite me being imperfect, they still love me as their mom. Motherhood is not about perfection after all. It’s about love. I am not a perfect mother but yes, I think I can fairly say I’m a good one. I always try to give it my best although admittedly my best sometimes or oftentimes falls short of my own (and the world’s) standards. Our husbands or even our parents can complement us as mommies but surprisingly, it’s our kids who affirm that we’re doing a great job. Our kids may cause us to create our own demons but they are also the source of all positivity and encouragement we need in motherhood. No matter how much I think I fail as their mother, no matter how much chaos we’ve gone through the day and no matter how much we’ve hurt each other (not physically), at the end of the day, when I see them happy, I know I did something good and I know they will give me another chance to become a better mom when a new day breaks. Previous Post What’s up with Manny Villar?